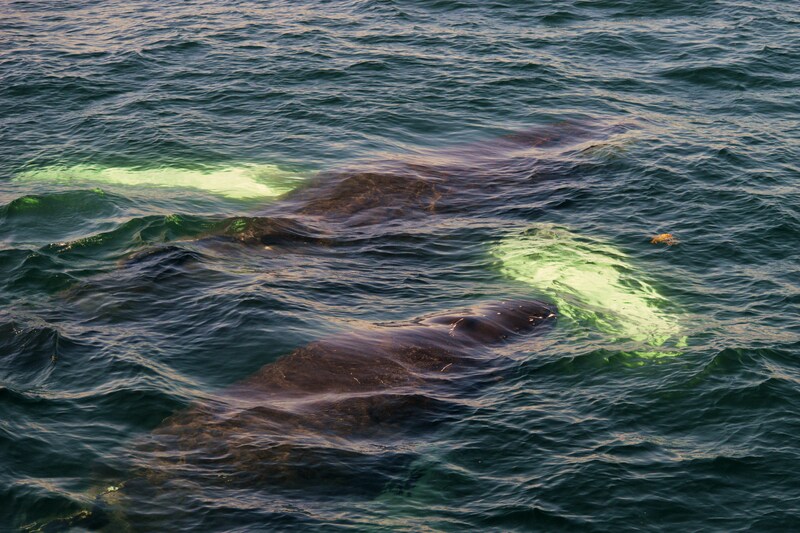 We have been traveling to the southern end of Stellwagen Bank lately, and the sightings have been great. We spent this morning with a mom and calf pair, and quickly identified the mom as Nile. 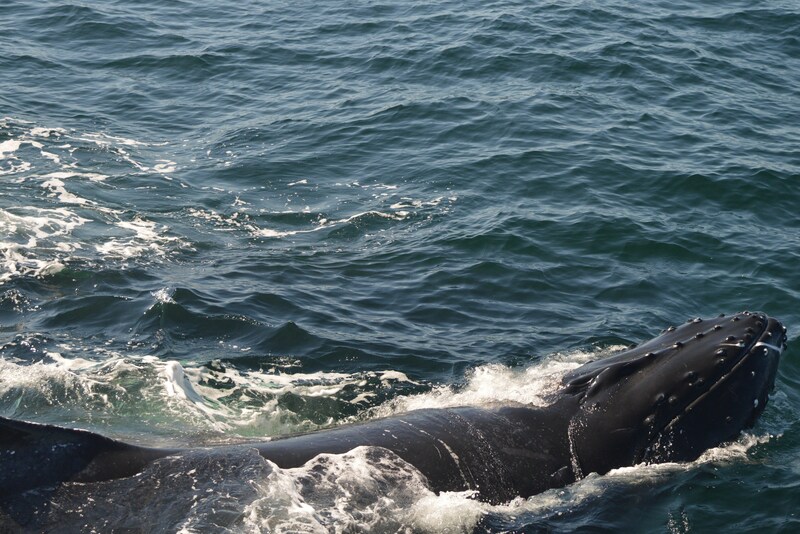 I have had many people mention that they had been on a whale watch before and have seen Nile- in fact, if you whale watched in Massachusetts last summer, chances are she was the whale you saw! We had some extremely close looks, as the calf surfaced just off the port side and remained at the surface for quite a while. It then began to stretch and bring its head up and out of the water, possibly to take a look at us? 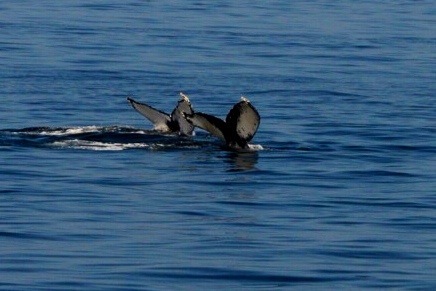 The afternoon was spent with three humpbacks. Two of the whales, Pele and Eruption have been in an association for a few days, and today Storm was alongside. Much of the time while these whales were swimming during their dives, we could see small bubbles developing at the surface. 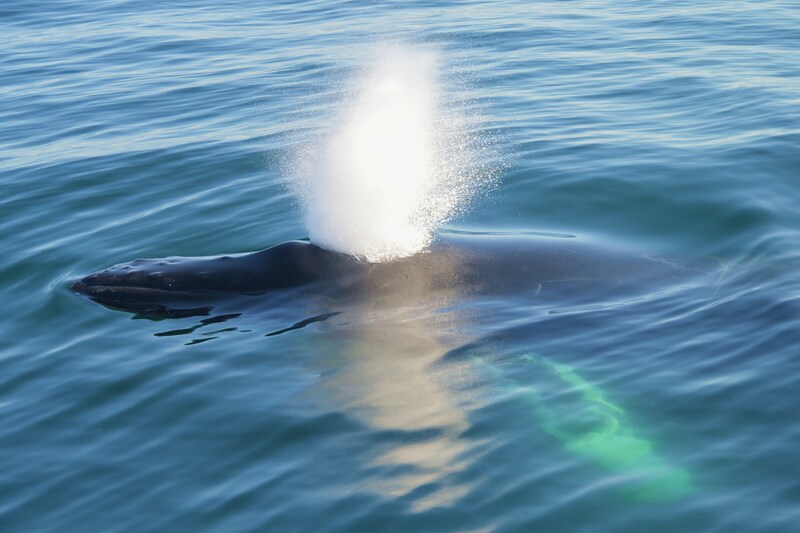 We have been seeing smaller, almost delicate bubbles rather than the large green that we often see when the whales are feeding. At one point, Eruption lunged up and gave us a great look! The whales continued swimming in a circle and feeding. Caught the beginning of that exhalation! We always like to remind our passengers that our whale watches are wildlife tours- they are unpredictable and we never know what we will be seeing or where those animals will be. That has certainly been the case over the past month. Our trips have ranged from watching two humpbacks (Northstar and Hippocampus) for days on the northwest corner of Stellwagen Bank, seeing fin whales and minke whales on Jeffrey’s Ledge, and unfortunately a couple of trips that left us without sightings of the larger whales. In recent days, we have traveled to the southern end of Stellwagen Bank, and the longer ride has proven to be worth the travel time. Yesterday we began with a quick look at a minke and a fin, however we knew there were humpbacks just within reach so we continued on. And we are glad we did! We began with Mudskipper and her calf, with the calf breaching and rolling over while mom was feeding beneath the surface nearby. 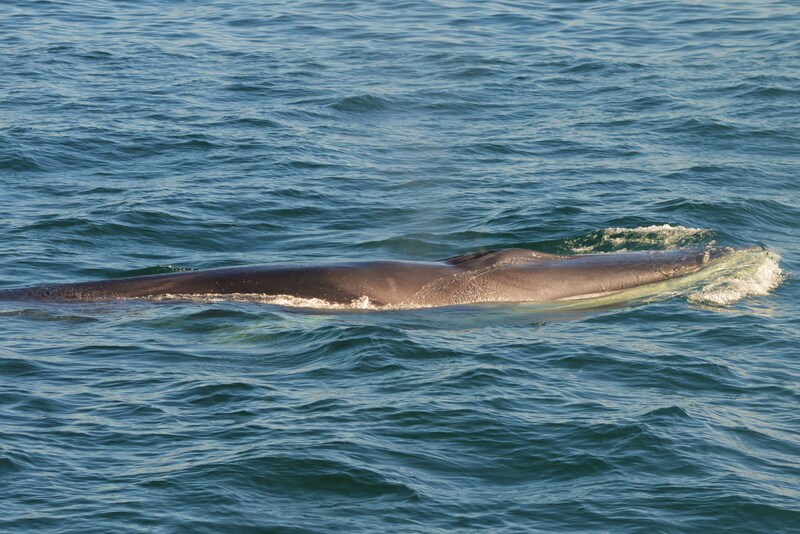 There were also a large number of fin whales out there- maybe 10 or more! We had some great looks at these beautiful animals. 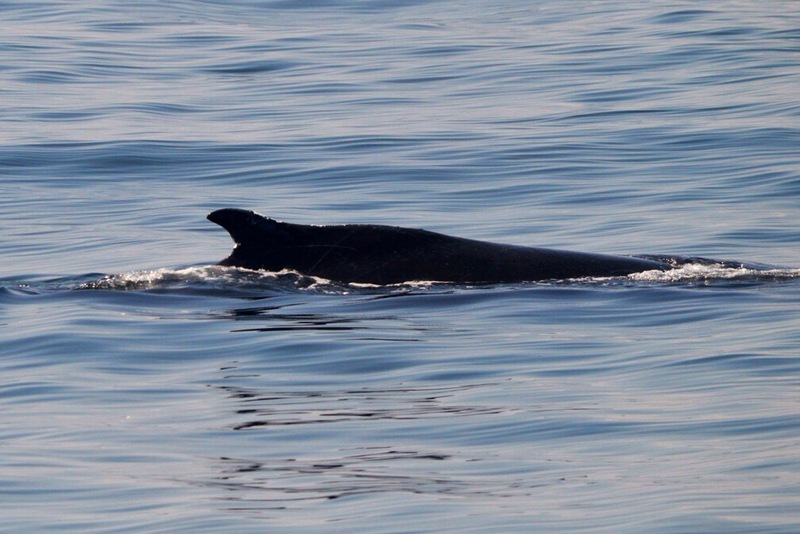 One of many of the fin whales we watched. With all of these whales around, we also had a number of birds sitting at the surface- greater shearwaters and sooty shearwaters among them. 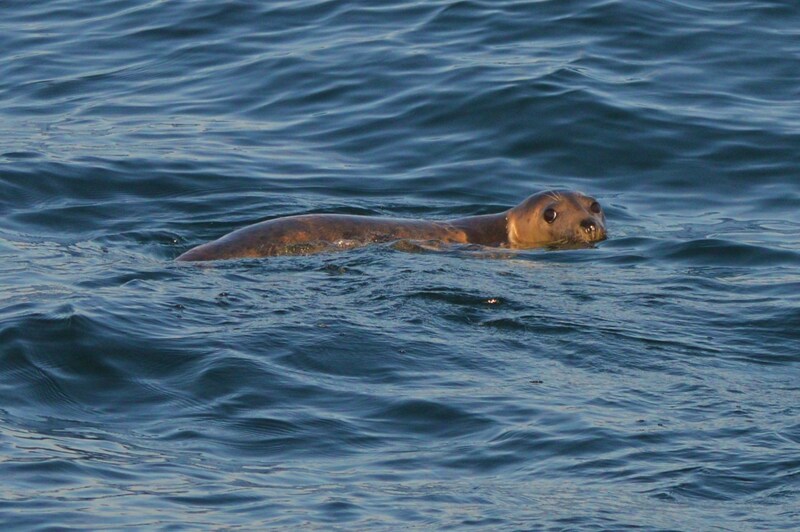 A couple of times throughout the trip we also had a visit from a curious young gray seal. 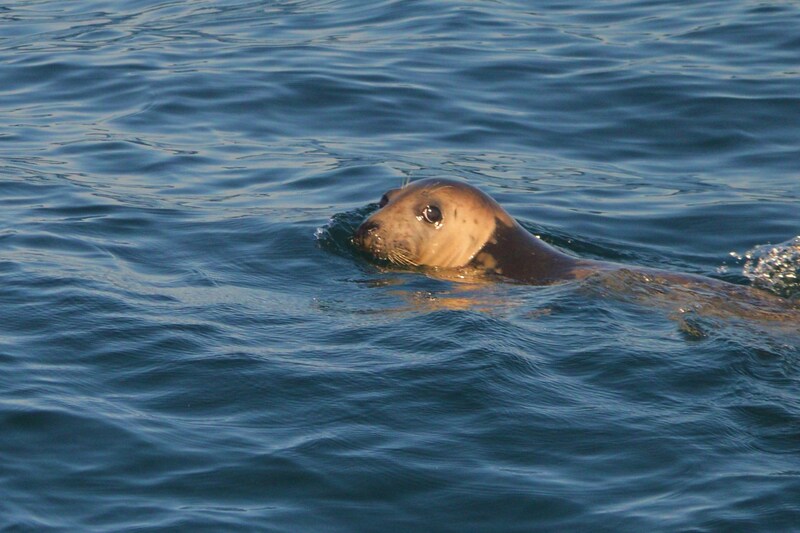 A gray seal takes a close look at us! 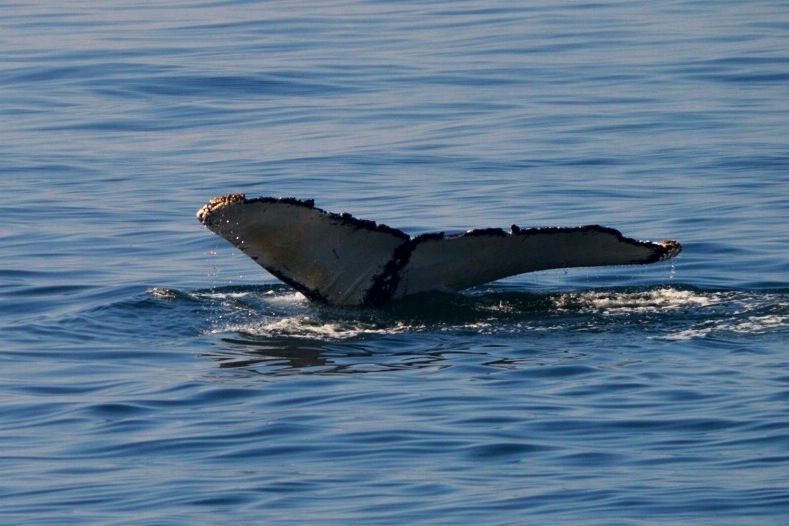 We also we able to spend time with four other humpbacks. One pair was easily recognizable- Nile and her calf! With the summer winding down we are enjoying the warm, sunny days that we have been having. Calm seas and friendly passengers made for a great ride as well! Nile’s distinctive dorsal fin with her calf on her left. 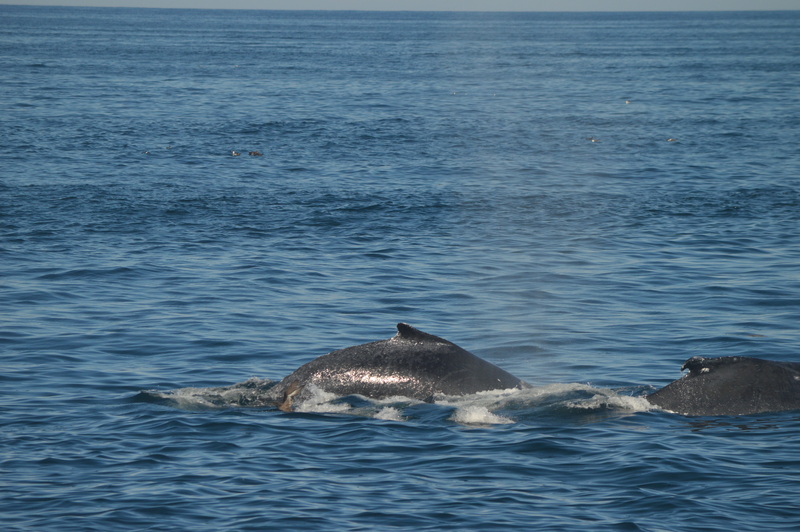 The water was glass calm on Stellwagen today and provided for some great looks at humpbacks as well as a minke whale. As we approached the area where Northstar and Hippocampus have been sighted lately, we noticed what looked like one humpback swimming alone. 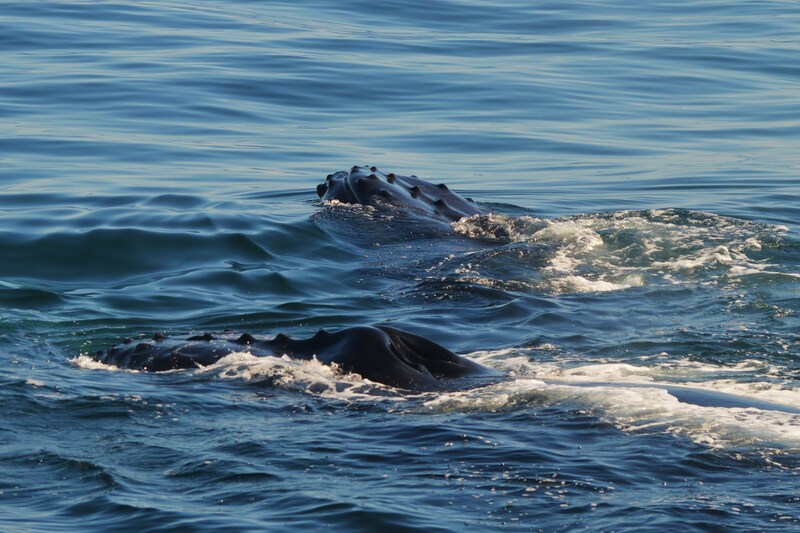 We were getting some great looks with the two humpbacks when a third, Tunguska, swam toward them. Tunguska swam alone for most of the time as we watched, however did surface right next to the pair one time. After that, we had a beautiful look at a double fluke with Hippocampus and Northstar.